Discover the impact a marquee can have on your event. If you’re looking for a unique wedding venue but think that all marquees are the same, then think again. Here at Weatherill Brothers, we’ve been custom making marquees for over 50 years. We design and build each one from scratch, according to the needs of our clients. So, if you’re looking for a bespoke marquee with a difference, then you’ve come to the right place. As well as designing the size and shape of your marquee, and providing the waterproof outer layer, our designers can work with you to create unique interiors with quality lining fabrics, wooden dance floors, custom-made bars, as well as windows, doors and more. If you’re buying a marquee, just get in touch and tell us what you’re looking for. If you’re hiring a marquee, then we’ve got a huge range of sizes, materials and options to create the perfect venue for your wedding or special event. 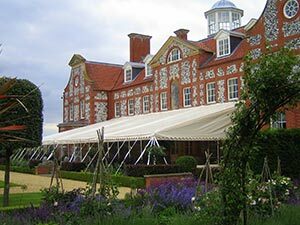 Our team of friendly and professional builders and technicians will create and assemble the marquee you’ve been looking for, taking care of every little detail so that you don’t have to worry. Just relax and enjoy your special day in your custom made marquee. Whether it’s a large or small marquee for sale, with ornate linings or to use as simple storage space.